The best way to learn more about the Old College Undergraduate Seminary program is to come for a visit. Visiting campus and staying at Old College provides the opportunity to experience the rhythm of daily life; Mass, community prayer times, study periods, social activities, and meals together. Meet other men who are discerning, as well as current Old Collegians. Come and stay for a few days, or a few weeks, in the building that houses the seminary, and experience life on the campus of the University of Notre Dame. Here are a few different ways that you can plan a visit. The Office of Vocations hosts Come & See Retreats for high school students both in the fall, and in the spring. These three day retreats are structured so that retreatants have an opportunity to stay at Old College, tour the campuses, and meet with a vocations director. This weekend visit will help to get a better sense of whether the undergraduate seminary program is right for you. 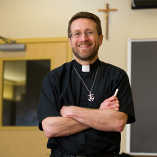 The Summer Seminary Immersion Program is a two-week academic course offered in conjunction with the Office of Pre-College Programs at Notre Dame. This program will help young men deepen their own consideration of God’s call through study of Sacred Scripture, and the Catholic Tradition. Participants will live in Old College, and their course work will focus on developing a deeper understanding of the priesthood. Sometimes scheduling conflicts make it hard to attend a retreat. 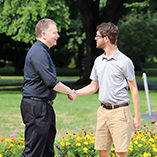 Call the Vocations Office to schedule an individual informal visit. Come and stay at Old College for a few days, and speak with a vocations director and the Old College rector while you are here. Attend a class with a current Old Collegian, and see first hand what life at the seminary has to offer. If you are planning a campus visit, call our office to schedule a meeting with one of our vocations directors while you are here. Old College offers a balanced and structured program that allows men to grow in their faith while discerning and preparing for a vocation to priesthood and religious life in Holy Cross. 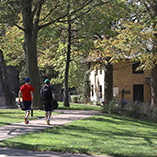 Learn more about life at Old College and the components of undergraduate seminary formation. Old Collegians are formed by a structured weekly schedule that emphasizes prayer, academics, and community life. The year is also punctuated by various community events and celebrations that integrate them into the life of Holy Cross and the Church.